- Derek McGrath and Jad Mager reprise their roles as Maquis-Starfleet officers Chell and Tabor. Chell was seen in season one's "Learning Curve", and Tabor was seen in season five's "Nothing Human". - Anthony Montgomery, who later played Travis Mayweather on Enterprise, had auditioned for the role of Tuvok's son. - Brannon Braga was responsible for a rewrite to freelancer Haskell Smith's teleplay but went uncredited. - This is the last episode of the series to be directed by Winrich Kolbe. 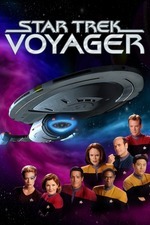 - It is in this episode that we first learn that Chakotay's ship was named the Val Jean. The name was displayed on the monitor that Teero was using to check on the Maquis' personnel files. - Teero's phrase to activate the repressed memories is "Pagh t'em far", a Bajoran word similar to pagh'tem'far, which was used to describe a vision from the Prophets in DS9: "Rapture". - Seven of Nine mentions that the ship is currently 35,000 light years from Earth. - Among the items in Teero's residence are models of the Maquis Raider used on both Star Trek: Deep Space Nine and in "Caretaker", and of the saucer module from a Galaxy-class starship. - Among the Maquis seen in this episode were Tabor, Chell, Ayala, Doyle, Jor, Yosa, Golwat, and an unidentified Vulcan female. This contradicts "Counterpoint", which made it clear that Tuvok and Vorik were the only Vulcans aboard. "These will make the images on the screen appear three-dimensional." "Let me get this straight: you've gone to all this trouble to program a three-dimensional environment that projects a two-dimensional image, and now you're asking me to wear these to make it look three-dimensional again?" "All ready for Attack of the Lobster People?" "I am not familiar with that species." "Your sarcasm could be viewed as subterfuge." You might remember Keith Szarabajka (Teero) from Angel, where he played the vampire hunter Holtz. You might not remember the episode of Enterprise he was also in. The movie Tom and B'Elanna watch in the holodeck, Revenge of the Creature, was featured in the first episode of MST3K's season eight, a major turning point in the show wherein they got a new network (the Sci-Fi Channel), new villains, and a new voice and puppeteer for Crow. I thought that this was pretty good, although there were a few unanswered questions, such as what Teero's end game is (at this point, the Dominion War is over and Cardassia lies in ruins; I think that there'd be a lot less enthusiasm for founding wildcat colonies in the former DMZ, even among the very few surviving Maquis) and how they think that they're going to go the rest of the way with a quarter of the crew. Some reference to "Worst Case Scenario" or even hinting that they might be able to recruit some of the Starfleet people would have been nice. And I think that the reveal of Tuvok as the attacker was a little too early; the potential of there being another Lon Suder in the crew, maybe even using Vorik as a red herring, might have been teased. But these are relatively minor things, and the idea of having a Manchurian Candidate who can infect other crew members with Teero's Maquis mental virus is an inspired one. I'm kind of at a loss regarding this episode. It's reasonably well acted. The plot holds together. There's continuity from last week and they even get the distance home somewhat correct. All that's required is that we believe Brainwashing by Mindmeld is possible, and several years after the Maquis were all wiped out, one of them is still alive and interested in taking revenge on Tuvok. The brainwashing technique Tuvok's employing could possibly be a reference back to Sybok's in Star Trek V, I guess. Maybe? Can't remember any other examples of a mindmeld being used that way in any other incarnation of Trek. Is it within the realm of possibility? Yes. But it feels really contrived. Other than that, there's nothing overtly wrong with this one. It just feels kinda pointless. Particle of the Week: Honorable mention to photons. The special effects on the holodeck reconstruction were cool looking. Pointless STO Comparison of the Week: There's a single mission in the Romulan arc involving Tal Shiar brainwashing that's pretty creepy. * Maximum Possible Photon Torpedoes: -17. * Lotta Idiot Balling in the second half. The first half of the story works well enough: Tim Russ is always great, and he can carry a farfetched premise like 'investigate myself for crimes I committed under mind control.' He sells it. However, once they knew he'd been mindmelding with the crew, letting his victims go without further observation and giving him free access to comms is inexcusable. Security like that, and it's no wonder everybody can break into all things Starfleet. * The Maquis plot element doesn't work. As you guys have already mentioned, Teero's actions make zero sense in the big picture. The Maquis were wiped out by the Dominion, interstellar politics back home are way different now, the Maquis integrated about 20 minutes after Caretaker, there's no indication what Teero even wanted besides revenge, etc. etc. etc. The reveal mostly served to remind me of how badly they handled the Maquis stuff right from the jump, rather than feeling like the aforementioned Worst Case Scenario or something. I mean, at least stuff Seska did made some kind of sense. Anyway... mostly with zarq's take here: it was fine to watch, but also pointless. Also, did they really lock up Tuvok with his communicator? Isn't that a no-no? They totally did, and I can't imagine why that would not be against procedure given the way voice commands work on Starfleet vessels. It should be SOP for the brig, since everyone else takes them away; the Dominion took Worf and Bashir's when they were in the space stalag, which is why Garak had to jury-rig the communicator to signal the runabout. That would explain so much. I'm suddenly wondering how 'VGR' was never Voyager's three-letter shorthand. Also, apparently STO's 'Victory is Life' update dropped and I missed it entirely. S'pose I will have to pop in and find an excuse to talk about it at some point. ... so, I've been reading that confessions Tumblr all day - sort of a 'fell down the rabbit hole' kinda binge, and I've learned some more stuff. * Tom Paris got a Threshold action figure that appears to be real. * Star Trek confessions are apparently really popular, supporting multiple blogs like this. I'd resisted posting any links to the Intiraymi stuff, but yeah, it's pretty not-great.